CLICKing November with Aglio Et Olio | What Smells So Good? With the theme for November's CLICK event (hosted over at Jugalbandi) being noodles, I figured, hey, what could be simpler than good old garlic and olive oil? I love my garlic, but I can't eat the oil, and I have to confess that even when I could the combination was never a "wow" in my books. I always found it boring! I've zipped up this version a bit with anchovies and red pepper flakes, and used a great buckwheat pasta, for a hearty, flavourful experience that I hope to be able to experience again in the future. The recipe is after the photo. This photo was taken, like almost all my others, in our kitchen using my trusty Kodak EasyShare C613 Digital Camera on the "close-up" setting. Unlike my previous entry to this event I decided this picture was better in colour, highlighting the yellow egginess of the pasta and the hue of the olive oil against the steel pot lid I used as a background :D. A simple photo, a simple dish, and a simple, yet perfectly descriptive name. Add oil to a large pan over medium heat. Add anchovies, garlic, and pepper flakes. 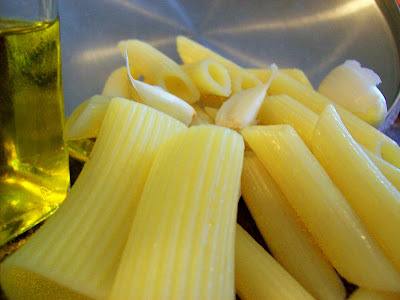 Break up anchovies until they melt away into the oil and garlic mixture. Toss pasta in the pan along with the parsley. Season with a little coarse salt, to your taste, and serve immediately.